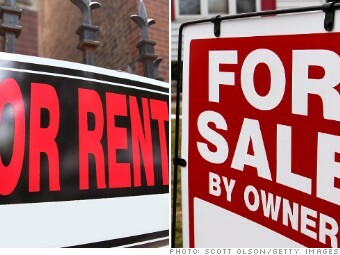 Deciding whether to buy or rent? Here's how the math plays out for some of the nation's biggest cities, according to real estate site Trulia. Figuring out whether it's better to buy or rent rests on three main factors: where you live, how long you plan to stay and how home prices compare to rents in the area. Real estate website Trulia analyzed data from 100 major metro areas to help determine that last factor. While markets vary wildly, prices are so reasonable and interest rates so low that buying is the better option in most of major U.S. cities, said Jed Kolko, Trulia's chief economist. Nationwide, home buyers who remain in their homes for three years will save an average of 19% over renting. If they hold onto their homes for 7 years, the savings advantage grows to 44%. That means all of the initial transaction costs of buying -- the broker's commission, title insurance, legal fees and other closing costs -- will be offset by benefits, like tax write-offs and price appreciation. And those costs will become cheaper than the total costs of renting, which include insurance and agent commissions. Home prices rose 7% year-over-year last month while rents went up only 3.2%, according to Trulia. "Buying is still cheaper than renting but the gap is closing," said Kolko. Savings are based on a comparison of total housing costs for buyers and renters and include transactional cost, such as commissions, taxes, appreciation and opportunity costs, like the potential returns of selling a home. The calculation assumes homeowners will put 20% down on a 3.5%, 30-year fixed-rate mortgage, will itemize deductions and are in the 25% tax bracket.